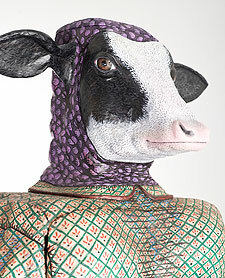 Her "Humanimals" series contains 13 life-size cabinets addressing the relationship between humans and other animals, particularly the issue of speciesism: the "right" humans have to dominate, oppress, and/or exploit other animals. Artrageus 1 is a gallery exhibiting art that makes sense (of the madness), art that makes fun (of the madness) and art that tells a story (of the madness). The owners of Artrageus 1, Gayle Weitz and Nick Biddle, are lifelong educators who recognize the great hurdles facing humanity in the pursuit of peace, justice, and sustainability. The gallery is a medium for stepping back and enjoying the creativity of people standing up to those hurdles. 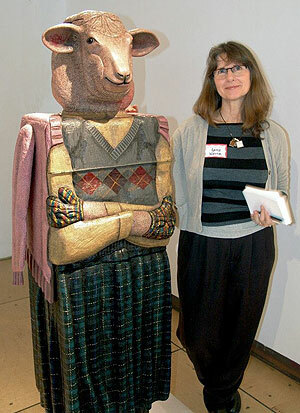 Gayle is an artist, and her work is the centerpiece of the gallery. Artrageus 1 exhibits whimsical art that pleases the eye and political art that tickles the mind. It also sells a range of literature relating to the causes and consequences of current conditions, and Tiny Footprint Coffee, the world's first carbon-mitigating coffee. Both Gayle and Nick have been university professors since the early 1990s. They met while teaching at Appalachian State University (ASU) in Boone, N.C. Gayle taught art and art education there for eighteen years. Nick taught Latin American history at ASU and later at West Virginia University. In 2010 they moved in together and moved to western Pennsylvania to teach at Seton Hill University. Last May they retired from academia and moved to Brattleboro. "I make and exhibit artwork to get people to think and to question, and possibly to change. I teach art to expand its power to heal, inspire, question, and validate society and the individual. I believe in the power of truth, and in the power of education and art to reveal truths, serving as a non-violent catalyst for change." From Nick's perspective as a historian, truth is a touchy subject and much disrespected these last few decades. Quoting another historian, Gary Wills, Nick notes that "the whole structure" of the National Security State under which we live "is outside the Constitution." Moreover, from the start "it was in multiple ways unaccountable to the Congress or the people, was secret and secretly funded, resorting to subversion, sabotage, and assassination." The real problem then is that since accountability is the essence of democracy, when "people do not know what their government is doing, they cannot be truly self-governing," which is to say, they don't really live in a democracy. So ask yourself, do you live in a democracy? You see, truth is a touchy subject. Getting at the many interstices of truth in a re-creative fashion is the objective of the gallery. To that end the gallery has several components. Drawing upon the twenty years of schooling it took to teach on the dayshift, Nick has assembled a small selection of his favorite books for sale, rumination, and launchpad conversation. Their focus ranges from Cold War architecture to alien abduction, from Neolithic matrilineality to unidimensional consumerism, from corporate personhood to renewed Enlightenment. To give fuel to investigation of the books and their content, Artrageus 1 is happy to sell Tiny Footprint Coffee, a brand that takes Fair Trade coffee a step further. To be sold by the bag (tasting available), 5% of all gross proceeds go to the Mindo Cloudforest Foundation in Ecuador, where they are used for reforestation. Rainforest Alliance monitors the trees planted to quantify the carbon captured thereby. Using the Rainforest Alliance's formula for measuring carbon emitted in the cultivation, transportation, and packaging of Tiny Footprint Coffee, when matched to the carbon captured by the proceeds used for reforestation, results in a net capture of carbon emissions five times greater than their release in the coffee's production. If that sounds confusing, it is. The basic point is, you drink coffee and the foundation plants trees. Artrageus 1 blends artistic forms for fun, exploration, and the possibility of positive change. Gayle and Nick are excited to be in Brattleboro because this is where they see those dynamics underway. They are even more excited to be opening for this Friday's Gallery Walk. Please stop by to meet them, enjoy Gayle's art, and begin your own search for truth.